Last September I posted an article titled "Reframing School Drop Out as a Public Health Issue. While the SunTimes has called for action by CPS, I hope you'll all read this and encourage hospitals, universities and business groups to take strategic roles in keeping kids in school, and preparing them for jobs and careers. I encourage you to read some of the blog articles on the Smart Communities blog, which illustrate reasons for business and hospitals to become strategically involved. My goal for the May and November Tutor/Mentor Conference is to have leaders from these industries host 70 minute discussions, sharing what they do, and building visibility for pro-active strategies that mentor kids to careers. If you can organize such a workshop, or host a panel, submit a workshop presenter form as soon as you can so we can begin promoting your involvement. The feature editorial in today's Chicago SunTimes shows that Chicago Public Schools had a staggering 44% drop out rate and that the rate for Black males was even higher, at 57%. Apparently CPS held a "drop out summit" this week to develop solutions to this problem. I have two comments. 1) about time; 2) why weren't we invited. I've written about the Drop Out crisis in previous articles such as here and here so I don't know why this is suddenly a "news" for the SunTimes. It's been a crisis for a long time. Read some of the drop out crisis articles on the T/MC site and you can learn a lot about this crisis. And volunteer-based tutoring/mentoring has been a solution for a long time. It's just that the leaders at CPS, and in the Mayor's office, or the media, don't promote this as a solution with the same daily consistency as telephone and finance companies bombard us with ads for their products. What we have here is a marketing problem. We need leaders who will consistently advocate for volunteer involvement in non profits helping kids connect with tutors/mentors, sports, technology and a variety of other learning and mentoring solutions. And these don't need to be managed or operated by Chicago Public Schools. We have a window of opportunity. In early February a CEO Summit on Volunteerism was held in New York City, with a goal of unleashing $1 billion in pro bono business talent to support non profit organizations. Jim Morsch of the Lawyers Lend A Hand Program attended the Summit. His observations are posted here. Wouldn't it be great if a share of this were devoted to building and sustaining a full range of non-school, and school-based tutor/mentor programs who all were focused on helping kids move through school, advanced learning or vocational education, and into jobs and careers!! In May I'll be hosting the 29th Tutor/Mentor Leadership and Networking Conference since May 1994. I'm looking for speakers who can talk about the drop out crisis, and who can talk about ways that mentoring can be one part of the solution. I'm also looking for speakers who can show businesses how to be strategically involved in tutoring/mentoring, either in building capacity, or in building business programs that engage volunteers and support the growth of programs that serve their workforce development goals. Visit the conference web site to find details and submit a workshop proposal, or email tutormentor2@earthlink.net with your ideas. I've been participating in a discussion on the Social Edge site, which asks what keeps social entrepreneurs awake at night. We all have personal challenges that cause sleepless nights. However, people who run businesses, or non profits like Cabrini Connections and Tutor/Mentor Connection, have additional challenges. Such as how do we pay the rent, the payroll, or "how do we make a difference in the world". In a tutor/mentor program these challenges are how do we attract and keep key staff and talented volunteers, and how do we inspire kids as young as 4th and 5th grade to take more responsibility for their lives and their futures. Social Edge is one of many on-line forums where I network, learn, share ideas, and find volunteers to help in the work I do. In the Links Library on the T/MC site, I've more than 1400 links, pointing to forums like Social Edge, or other web sites where someone is working to help connect kids and adult volunteers, or where someone has information that might help others understand why and where tutor/mentor programs are needed, or why business, hospitals and universities should be strategically involved. By hosting this library I enable the people I connect with to meet and network with each other and I enable others working with youth and poverty to find information they could use to support their own innovation and decision making. I stay awake some night just thinking of new ways to try to attract people to this information. Every six months I host a conference in Chicago, intended to draw some of the people in my network, and links library, together on a face-to-face basis. Some people do workshops to share their expertise. Some people just participate to expand their network. The next conference is May 29 and 30, 2008 and will be held at the Northwestern University School of Law. The web site is http://www.tutormentorconference.org. I am now recruiting workshop presenters and I hope you'll either consider doing a workshop, or you'll make an effort this week to tell people in your own network about this event, so they can participate. The conference is just part of a sequence of events intended to help more and better tutor/mentor programs grow in high poverty neighborhoods of big cities like Chicago. It's intended to draw volunteers and donors directly to more than 200 different organizations in Chicago alone. You can find links to these in the T/MC Find A Program section. I'll sleep better once we have the roster of speakers in place. We'll all sleep better when we can surround kids with a greater range of adult supports and learning opportunities that create the type of hope, and opportunity, that is being promised in the current election cycle. Are you looking for a computer for your non profit? Are you looking to recycle used computers. Read this article and watch the videos on NorthShoreInsider. Andy Vass is someone I've known for many years and he is doing some great work. Today, February 13, 2008, in New York City, the Corporation for National and Community Service, the President's Council on Service and Civic Participation, and other government, and corporate leaders will convene the Summit on Corporate Volunteering: Towards a New Definition of Pro Bono. The goal of the Summit is to move toward 'pro bono' service becoming as common in the business world as it is in the legal field. The audience at the Summit will be corporate executives and we hope that the corporate community will leave the summit convinced of the benefits of pro bono service and skilled professional volunteering. All materials from the Summit will be posted on the CNS Web site. Jim Morsch, of the Lawyers Lend A Hand Program in Chicago, was a participant in the Summit. His observations can be found here. If this topic interests you, I encourage you to read some of the articles posted on this blog about leadership, maps, and No Child Left Behind. As you or your company develop a strategy, I encourage you to use maps to focus your help in all of the places where you do business, operate a facility, or where your employees live. I encourage you to use your marketing and visibility to give attention to volunteer service on an on-going basis, just as you use these tools to expand the visibility and market share of your company and its products and services. Finally, I encourage you to use the Tutor/Mentor Connection web site as a resource for your decision making and a partner in your efforts to create a pipeline of kids from poverty to your workforce. Lawyers support Chicago mentoring with $240,000 in grants! On January 31, 2008, the SunTimes Judge Marovitz Lawyers Lend a Hand to Youth Program awarded $240,000 in grants to 31 different Chicago area tutor/mentor programs. The map shows the location of recipients in different parts of Chicago. Below is the list of recipients. Web links are included for programs with web sites. Christ Evangelical Church, Brain Boosters; also winner of 1st Annual SunTimes Literacy Award, a $10,000 additional grant. Centro Communitario Juan Diego; also winner of the 2007 Thomas A. Demetrio Award, a $10,000 additional grant. Tutor/Mentor Connection(TMC) - $30,000 per year for two years. Better Boys Foundation awarded a $10,000 grant. 14 years ago when the Lend A Hand Program was just starting, only one award, of $2,000 was given. By 2006 the total amount of grants that had been awarded was nearly $500,000. The huge growth in 2007 is due to the receipt of a special award from the Chicago SunTimes, which will enable the Lend A Hand to give grants of this level for at least the next 10 years. However, while this money is important, the average grant was around $5,000. This is a small fraction of the operating cost of most tutor/mentor programs. Thus, we urge leaders in other industries, in faith communities, and in civic and social networks, to duplicate this generosity, so that volunteers, and dollars, can come to tutor/mentor programs in Chicago from many different directions. This is truly what is meant when we say "it takes a village to raise a child." 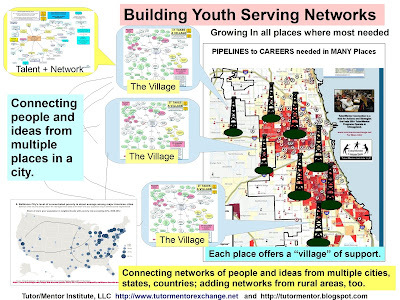 I encourage you to visit the Mapping for Justice blog each Monday to follow the progress of the T/MC in updating its capacity to use maps for social justice, collaboration and to help make more and better tutor/mentor programs available in high poverty neighborhoods. 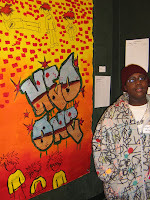 On Friday, February 8th, the Cabrini Connections tutor/mentor program held an Arts and Video Festival in Chicago. Click here to read more about this event. Lawyers in Chicago Lend A Hand - with $240,000 in grants!! 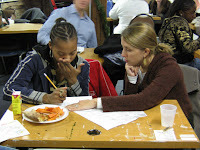 On January 31, 2008 33 different Chicago area volunteer-based tutoring and mentoring were given grants totaling $240,000 by the SunTimes Judge Marovitz Lawyers Lending a Hand to Youth Program. Next week I'll post a complete list of winners. Let me just say that one program receiving a grant of $5,000 was Cabrini Connections, the tutor/mentor program that I've led since 1993. We started Cabrini Connections with just 7 volunteers, 5 teens, and no money in 1993. Since then more than 500 youth and 600 volunteers have been involved. Look here to see some of the metrics that we use to evaluate this program. When we started Cabrini Connections, we recognized that no one in Chicago had a master database of tutor/mentor programs, and no one was leading a year-round marketing effort aimed at helping tutor/mentor programs grow in all parts of the Chicago region. We created the Tutor/Mentor Connection in 1993 to fill this void. As we built our database of programs we began to share information and learn what issues all programs had in common. Our first survey in 1994 indicated that many programs were isolated from each other, so in May 1994 we launched the first Tutor/Mentor Leadership Conference. Many programs are constantly searching for volunteers, so we published our database as a printed directory, and sent it to businesses and foundations and media, and to each program. In 1995 we launched a citywide Back to School Volunteer Recruitment Campaign, intended to help all programs get volunteers as school starts each year. Most tutor/mentor programs are non-profits, and most programs are constantly looking for operating dollars, so in June 1994 when the Lend a Hand Program was just starting, and was a part of the Chicago Bar Foundation, we suggested "why don't you become the first foundation to fund general operations of constanly improving tutor/mentor programs in all parts of Chicago." We agreed to work together to achieve that goal, and while the first award in 1994 was $2,000 to a single program, the grant total at the January 31 distribution of 2007 awards, was $240,000. Part of that was a $30,000 grant to the Tutor/Mentor Connection to help us keep doing what we do to maintain this information on tutor/mentor programs, and to support the growth of tutor/mentor programs. One of the people most responsible for this growth is Jim Morsch, Managing Partner of the Butler Rubin Saltarelli & Boyd LLP Law Firm. Jim was one of the first volunteers to join the Lend A Hand Advisory Board and to see the great potential of lawyers helping kids in all parts of Chicago, not just in one or two highly visible programs. I encourage you to visit the Lend A Hand web site to meet Jim and others who are part of this great program. 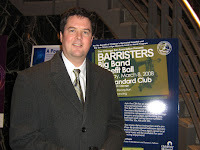 One of the ways Jim and the Lend A Hand Raise visibility for tutoring and mentoring, and raise money for the annual grants to tutor/mentor programs, is through events like the Annual Barristers Big Band Benefit Ball, which is set for March 8, 2008 at the Standard Club in Chicago. Contact Karina Ayala-Bermejo, Executive Director of the Lend A Hand Program, at 312-554-2041, if you'd like to be a sponsor, or order tickets. While you can make a bequest or a donation to support the Lend A Hand, you can also search the Program Locator and Chicago Program Links on the T/MC Web site, and find programs that you can support directly, with your time, talent and dollars. As more people give this support, more of our youth will get more consistent adult support and enriched learning, that is essential for success in school, and in life. Thank you Lend A Hand for helping us do this work. I've joined the Non Profit Blog Exchange once again and have been partnered with a blog on the web site of the Non Profit Congress. I had visited this web site in the past, and even posted a few comments, but the blog exchange encouraged me to take a new, and deeper look. I found a lot of things to like. 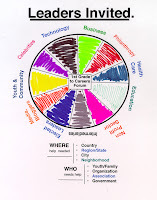 For instance the overall purpose is to a) Increase Capacity at all levels of nonprofit organizations; b) help networks of non profit leaders grow at the local, state, and national level; and, c) Inspire Engagement at the state and local level to increase involvement in non profit capacity building in all states, across all sectors. I see many efforts on this site to give a voice to anyone who wants to offer an idea, or wants to get involved. This is good. Because I'm such a fan of maps, I was pleased to see a map of the United States, that you can click to find contact information for local leaders in different states. Looks like Illinois could use some local leadership. However, I see room for improvement, too. I'll write about these suggestions here, and post them on the Non Profit Congress web site also. a) on Feb. 12 and 13, 2008 the President's Council for Service and Civic Participation is hosting a CEO Summit in New York City, with a goal of unleashing $1 billion in corporate volunteer talent to support the non profit sector. b) the Non Profit Congress will hold its 2008 National Meeting in Washington, DC on June 1-4. Unfortunately, the National Conference on Volunteerism and Community Service will be held in Atlanta, on June 1-3. My own Tutor/Mentor Leadership and Networking Conference is May 29 and 30, in Chicago. While the Non Profit Congress does a good job of enabling people to participate on the site, they, and Points of Light, and others need to enable people attending conferences in one place to connect with others who are attending similar conferences, in other places. In the Tutor/Mentor Conference format we've created a List of Attendees that participants can subscribe to. This encourages people to contact folks who will be attending our conference, before, during, or after the event. It's what happens between conferences that proves the value of a conference, or a network. I'd like to see more people who convene groups -- for conferences, press releases, research briefings, etc. -- do this, so the people inspired by an event can connect with each other, in a variety of formats, to do the work the conference or event was trying to inspire. c) while it's great to build a national movement, and generate more public awareness, unless this distributes public attention, volunteers, and operating dollars, to every part of the country, and to small organizations, as well as national brand names, it's not going to help improve the capacity of thousands of non profits who struggle every day to do good work. I would like to see the Non Profit Congress borrow a concept from the Boston Innovation Hub, and add an issues map, so that people interested in a similar issue could group together more easily, and work within their sub group, not just their state, to achieve the overall goals of the Non Profit Congress. I would also like to see them point to Internet-based databases that enable volunteers and donors and clients to search for specific programs in specific zip codes. What's great about the Non Profit Congress is that I can not only write these ideas in my blog, but I'm encouraged to provide them as suggestions on the NPC's web site. I encourage you to take a look, read their blogs, visit the sections on Public Awareness, Capacity Building and Leadership, and become part of this effort. The Editorial in today's Chicago SunTimes provides 5 ways people can vote with their time and their actions, to make a difference in Chicago. It's a good reminder that while we spend millions to elect a President and other public officials, it is the work of individuals, and groups, that will determine the quality of live in this country. In past articles I've talked about failing education, and how to respond to acts of violence. In the SunTimes article the writer wrote "Nobody can clean up the big problems on the day in an instant -- the faltering economy, the war in Iraq, global warming." I agree. And I thank the SunTimes for pointing to the Tutor/Mentor Connection web site as a resource for finding places in Chicago where you can be a tutor, or a donor, or where you can use your talent to help build a web site, or do the accounting, or help with fund raising. But this is just the starting point. 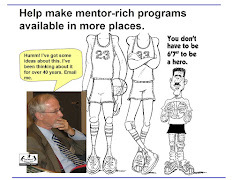 The Tutor/Mentor Connection web site is a resource library, where you can find articles about where tutor/mentor programs are most needed, why they are needed, and how you can help make them more effective. If we want to end poverty, or solve any other major issue, we need to build personal involvement, and build a learning process, so that as we continue our involvement, we understand the issues more, and we can be smarter about how we use our time, talent and dollars. I outlined these steps here. If you get involved in tutoring/mentoring, and use the T/MC site as a resource, and a place to share your ideas and experiences with others who are involved in different programs, even in different states, the collective experience of each of us will add up to an army of knowledge, and commitment, that will help any leader we elect to make a bigger difference in the future of our society.